But yeah, Empire of Storms came out…. for those of you who don’t know. The fifth novel in the Throne of Glass series, following the adventures of assassin Celaena. And if you’re reading this review then you know that Celaena is also Aelin, heir to the throne of Terrasen. This book follows Aelin as she struggles to get onto the throne and as the forces of evil close in around her. The world becomes more dangerous as Aelin discovers what it truly means to be the Heir of Fire. The stakes are higher, the fights are harder. Although I really liked this novel, I feel like there were some problems. They were only small details and the overall feel I got from this book was great, I just think that Empire of Storms could have been a bit better. I really liked how there were so many clever plot strands that wove together well. This book was one of those books where everything just worked so well, but I felt like some of the things that happened came out of nowhere. I wish there was a bit more foreshadowing on these things so I could look back and be like ‘oooh that’s where it came from,’. There were just so many twists which kept the plot moving and made the book less predictable. However some of them took the book in directions I didn’t really like which I guess was to be expected. I did become really engrossed in this book which was a good thing and there were so many moments that I feel close to the characters and happy with their success. All the characters developed in the book and I liked how we got more insight into the other Fae males. I found the amount of sexual content in this book unnecessary, it was a large jump in content from the previous book in the series that seemed to have little relevance to the plot. Some of these scenes lasted multiple chapters which was a bit of overkill. Elide and Lorcan together ahh…. I really do ship them, but I feel like they got together far too quickly. but then when all the other characters started being put into relationships it just felt forced. I mean Aedion and Lysandra, Manon and Dorian, it all got too much. I bet in the next book Chaol and Nesryn become a couple and oh yeah, they were missing for the whole book. Why?? I kind of feel like Sarah J Maas just decided writing two more characters would be unmanageable which just sound silly considering how many characters there are in Empire of Storms. And did I mention I hate Rowan… please don’t kill me but he just annoys me. However the main problem with the book that I found was that all the characters were so special. Manon wasn’t just the heir to the Blackbeak witches but also the last Crochan queen. Really? The characters that I like the best are actually the less powerful ones (as a friend pointed out to me) so Elide and Chaol. I really did like Elide’s development in this book, she is quickly becoming a character that I adore, however once she joined the others it feel like she faded into the background. I don’t want that, I want Elide being strong and involved in battles and showing just how clever she is. I ended up giving Empire of Storms a four out of five, these few factors are what stopped it from being a five out of five for me. It was still a thoroughly enjoyable read and a strong continuation to the series. However it did feel like it was building up for the last book meaning the focus wasn’t actually on this book. Hopefully the last book is worth the wait. 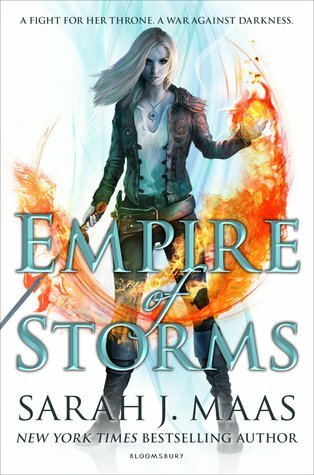 What did you think of Empire of Storms? And who do you ship? I agree with so much of this. Where was Chaol? Why on earth would you just not bother with a character who’s been so important in all the other books? I think there’s a short story or novella out/coming out from his perspective but I don’t get why he was just sidelined. Also, I too dislike Rowan. I find that I roll my eyes every time he speaks. And yes, clearly everyone is secretly the queen of something. Probably I am secretly a queen but nobody has told me yet. Haha I am glad that to see that I’m not the only one who felt that way.